Please be patient as photos load. Post cards are a great postal announcement and sales tool that can be combined with other custom, personalized stationary (envelopes, letterhead, informal, business sized cards, etc. ), forms, flyers & brochures! Don't rule them out for an unusual note - great for quick and distinctive holiday cards or special requests. Post cards have proven themselves to be an inexpensive and successful marketing tools in not only the historical and genealogical book selling market but others as well. As reminders and notices, they are the most economical piece of mailed literature in quantities under 200 - for all postage rates. Being a fairly odd size in today's mailbox draws the target receivers attention to the item, while saving mailing costs. If cutting post cards from a larger sheet of stock, check with USPS to see what the current maximum postcard rate size/dimensions is for maximum advertising space with minimum postage. Postcards can be great small promotional pieces - even if they are never meant to be mailed via USPS. Great for cover-flat items, book marks, oversized business cards, trading, rolodex, book plates, and more. Today, color post cards are also being used instead of full printed catalogs for sample or spotlight item advertising. They are fast becoming the twenty-first century's handbill. They bridge the gap to drive traffic online from those who still prefer printed notice to those who willingly navigate by smartcode, and still reach outside the virtual world. 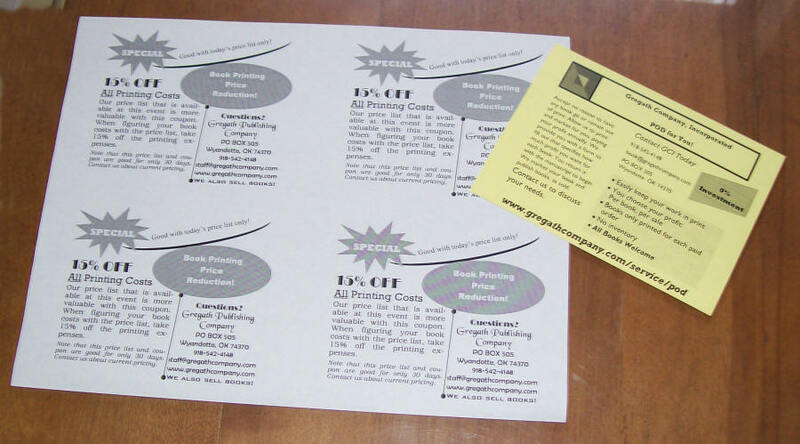 They can be used as notices to put on bulletin boards and fit easily in a file-o-fax. Being on card stock, they are even easier to find than a standard piece of paper in many "desk top jumbles". Great way to target a single item or detail! Post cards are fully customizable and are great for all sorts of communication from birth and celebration announcements to meeting notices and deadline reminders. They are super for informal graduation and marriage notes or inserts and invitations of all kinds. They are beginning to even take the place of formal thank you and "informal" cards. Affordable as these cards are, they may be the only stationary item at your correspondence desk that you still haven't considered having personalized. Special Card Design Note: Be careful in adding your name/address to a postcard design. As both sides of the mail piece are fully viewable and the only notice of which side is "up" is postage, do not place your name and address in a standard addressing format (3 lines roughly center of card) on either side of the card - unless you want the card returned to you. Because of the nature of mailed cards, and automated systems, cards may get "flipped" in the mail stream and returned to you: this acts as a return service, effectively "using" the postage to mail the card to yourself. They can also be cost effective reply and/or ordering forms. A post card costs less than a letter to return to you (in both postage and printing), and as a supplied convenience to your customers can cost the same or less than an return slip and envelope. This is great for economical RSVPs, "bill me" order forms, pledges, etc. Event and reunion planners can use these for requests, name tag information, actual tickets, keepsake/commemorative/event merchandise and door prize promotion, donation, freebie and door prize requests, etc. ID/Privacy note: While post cards are highly versatile and a great economical alternative to many types of physical mailings, one shouldn't plan a post card that requests any information be placed on a provided post card that could lead to identity theft. While it is a felony to tamper with the US Mail Service, most people that fill out return post cards don't take into consideration protecting cards, such as placing them into envelopes, before they get into the mail stream - especially when return postage is provided on the post card itself. Alternate suggestions include, instead of blanks to fill in, a check box for "use information on file"; provide a telephone number (reminding person not to use cell or cordless phone) for information verification; etc. When requesting information be sent back to you, in general, you can ask for anything. Don't expect a person using a provided postcard to think about protecting there information by placing it into a security envelope, many may simply choose not to provide ID sensitive information. Post cards can be produced for a single need and use, or they can be produced in quantity and used and adapted for a wide variety of needs over time! In addition to producing post cards in a wide variety of sizes and styles, as a full service publisher, we can also address and mail (or bulk) your post cards for you. This can be done with supplied labels, or addresses. Send us your needs and your addresses, sit back, allow us to send you the card for approval and let us take care of the rest! Flat printed on one side, 4¼x5½" white matte index stock, from your layout or ours. Artwork, drawings, maps, signatures, order blanks, etc., may be used at no additional charge. Post cards may be ordered in any size, including postcards that will not mail via USPS on a "postcard" stamp (8x10", 4x4", etc). In addition to matte white, cards are available in many other colors and textures such as gloss, and linen, at additional price supplement (varies according to paper mill pricing at time of order) - free quotes available on request. offset printed (#100+): in house color stock or black ink - other ink colors, or full color, are available. POD - inquire for quote in as small a quantity as 4 (that's right - 1, 2, 3, 4)! Thermograph (raised printing) or flat printed on any other size are available for other prices. Other options also available such as full color, fold up, partial coating, perforated, etc.